This article describes a Shock Hazard Tester, which might be of significant interest to those of you who restore older audio equipment. Parts cost except for the enclosure is about $25. From the end of World War II until the 1960s when transistor radios be came popular, low-cost AM radios had no power transformer. The five tubes had series-connected filaments whose total voltage allowed the radio to be operated directly, off the AC line voltage. A typical tube lineup consisted of 12BE6, 12BA6, 12AV6, 35W4, and 50C5, for a total of 121V. Some areas of the country still had DC line power so the sets were known as AC/DC radios. One side of the line cord was connected directly to the chassis. Since there were no polarized plugs or outlets in use back then, there was a 50/50 chance that the hot side of the AC line was connected to the chassis. The radio user was “protected” from a possible fatal shock by the plastic radio case and knobs, fiber sleeves on the control shafts, and a fiber rear panel. However, if you came in contact with the chassis or any of the metal parts or hardware, you could be electrocuted. The fuse for the outlet would not open because the fatal current flow through the human body is too low. You could sometimes determine the proper plug polarity by the slightly higher hum level when the chassis was not connected to AC line neutral. Those with DC line power were a bit more fortunate—the filaments would light up if the plug was backwards, but the set wouldn’t work since the rectifier tube blocked the reversed plate voltage. Eventually, consumer safety became an issue, and polarized plugs and three- wire outlets became the norm. With the switch to solid-state, consumer audio equipment needed power transformers to derive the lower internal voltages. The transformer provided an effective isolation barrier between the user and the AC line. Three-wire power cords connect the line and neutral to the transformer primary, and the chassis to ground. The ground wire provides a low resistance path to “earth” that is independent of the two AC line current conductors in the equipment. Since the ground wire is attached directly to the metal en closure, it holds the chassis volt age at ground potential. Should the hot side of the power cord come in contact with the chassis, the line fuse or breaker will open and provide protection against shock. One problem is that the safety ground wire can be defeated if you use a non-polarized ground lifter plug adapter (“cheater” plug) to connect the equipment to an older two- prong outlet. The equipment will operate normally without the ground wire because it’s not a part of the conducting path that supplies the electricity. If the ground wire is broken or removed, you usually won’t be able to tell the difference. If line voltage comes in con tact with the chassis because of a frayed cord or an insulation break down, there may be a shock hazard. In addition, a lot of equipment today uses a two-wire polarized power cord. The chassis is left floating with respect to the AC line, or may be referenced to the AC neutral through a resistor or BC network. A latent insulation failure can place AC line voltage on the chassis. In the worst-case scenario, the person operating the equipment may become the only current path to ground. If the AC outlet has been mis-wired, a similar shock hazard can exist. If you suspect any problems, you should test the out let for your audio equipment with an outlet tester. Radio Shack sells an inexpensive AC outlet tester (22-141) that includes a ground fault interrupt (GFI) test feature. Consumer equipment and appliances must be tested for earth (ground) leak age current and touch current. UL and IEC specs in the US, and similar specifications in other countries govern the standards for the current levels. Most manufacturers design their equipment to meet the global market requirements. The earth leakage current procedure measures the current from each of the AC mains phase conductors (line and neutral) to an accessible chassis connection on the unit under test (IJUT) with the ground disconnected. The newer touch current procedure measures current in the earth conductor from the supply side to the UUT. Measurements are made using all possible combinations of the AC mains polarity, and open and short circuit conditions of the earth conductor. Extensive tests have established an approximation of the human body impedance. Most of the body impedance is skin resistance. The skin resistance is reduced when wet, so hand-held appliances or those that may come in con tact with moisture have a lower touch current limit. The perception of shock is proportional to frequency, so the limits are also lower for equipment that may normally have RF leakage. Medical equipment must meet even more stringent limits since patients may have wounds that greatly reduce the body impedance. Leakage and touch current limits are designed to both minimize the risk of shock, and limit the involuntary reaction of the user that may cause physical injury. A human being can respond to a current as low as 0.5mA (500 so it’s not much consolation to someone who gets mildly shocked, if the shock produces a muscular reaction that then causes them to fall from a ladder. In order to detect gross failures, resistance measurements are first made from the power conductors to the unit chassis. Next, the standardized ‘ impedance model” network ( Fig. 1) is connected to the metal enclosure. Equipment makers measure the leak age currents that flow from the AC mains conductors in all possible combi nations, to the chassis and through the body impedance model network (and potentially through the user) to ground. Equipment that has a three-wire power cord must not produce any leakage or touch currents beyond 0.25mA. For products with polarized two-wire power cords, the current must not exceed 0.50mA. Ground bonds for three-wire equipment are subject to a ground bond test, where a specified AC current is injected from the power cord ground to the chassis. The ground bond tester measures the resulting voltage drop to en sure the total resistance does not exceed 0.1 ohm. Above: Fig. 1: HUMIAN BODY IMPEDANCE MODEL. TABLE 1. Other items: project enclosure, hookup wire, solder, hardware, and so on. Insulation resistance tests are performed between the AC mains connections and the chassis at 500V DC with a meter that measures the resistance in megohms. The standard for consumer electronics equipment is 5M minimum. High-potential (hi-pot) testing may also be required on a lot sample basis, at 1250V AC. This is designed to prove that dielectric failure won’t occur due to power line spikes and surges due to lightning transients. Following the hi- pot test, another insulation resistance test is used to verify that there was no insulation damage during hi-pot. The schematic diagram for the shock hazard tester power supply is shown in Fig. 2, and the parts list is in Table 1. The UUT is plugged into 34. Fuse 1 is sized to be 7.5A or less, since in case of a fault you want the fuse to open rather than your household circuit breaker. Even a large power amplifier should draw less than 5A at no load (excluding those power hungry Class-A designs, of course). The optional neon indicator ( with integral 220k resistor) lights if the fuse opens. C1, R1, and R2 comprise the human body impedance network 31 and 32 are placed across Hi and allow an AC volt meter to directly read the equivalent leakage mA. Best accuracy is achieved if the voltmeter reads true RMS. 33 connects the human body impedance net work to the metal chassis of the UUT. The impedance of C1 is about 12k at 60Hz which introduces a small error in the leakage current measured across R1. PHOTO 2: Prototype tester. Rear view. However, the current through C1 leads that of the R1 and R2. At 120V AC, C1 conducts 9.95mA and R1 + R2 con duct 80mA The total current is 80.6mA due to vector addition, so the error measurement is less than 1%. Neon indicator 12 will light if the chassis voltage exceeds 70V AC or so, indicating a very hazardous leakage current condition. AC mains power from power cord plug P1 is connected to AC outlet 34 through line polarity switch S2, which allows you to reverse the hot and neutral AC line connections. It also opens the power in the center-off position. S1 allows you to open the neutral side of the line cord. The ground connection of J4 is returned through S3 to the ground wire of P1. S3 allows the AC mains safety ground connection to be opened during leakage current measurements. S3 is a momentary switch so the safety ground cannot be inadvertently left open. You can build the tester into any metal enclosure, even a dual electrical workbox. You can also purchase the power cord and single AC outlet at your local home improvement center. The remaining parts are listed in Table 1. Layout is not critical. If you use a dual workbox, you can use a standard single outlet wall plate. A blank wall plate on the second section would make a good place to mount the switches. You can mount the jacks on the side of the workbox. The power cord can come through one of the knockouts and be held in place with a cable clamp. The box should be deep enough to house the human body net work components. My prototype is shown in Photos 1 and 2. It does not have the two option al neon indicators. I used a 1 3/8” chassis punch to make the hole for the single AC outlet The three switches are mounted on the front, and the three jacks and the outlet are mounted on the rear. I used an IEC style power cord and put the IEC receptacle on the side of the chassis. Ground bond, insulation resistance, and hi-pot testing are beyond the scope of this simple tester. It’s limited to leakage and touch current testing. First, with the equipment power cord disconnected from the AC mains, mea sure from the hot and neutral plug spades to the UUT chassis. This should yield a very high resistance. Next, if the power cord has a third wire connection to the chassis, verify a very low resistance (less than 0.1 Ohm using a Kelvin measurement) between the ground prong of the plug and the chassis. If you use a DMM, you must subtract the residual resistance of the test leads from the measurement. For home-built or extensively restored audio equipment, Gary Galo suggests measuring the voltage be tween the chassis and the AC mains ground, and connecting the power cord to the power transformer primary in the orientation that yields the lowest AC potential between chassis and AC line ground. For units with three wire power cords, this requires temporarily lifting the ground (green) lead with a non-polarized ground lifter plug adapter. This will minimize hum and maximize safety. 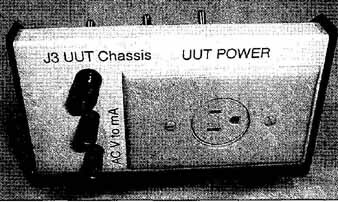 Make sure the UUT chassis is isolated from any possible AC mains ground contact (cables to other equipment, a metal stand, and so on). Make sure you don’t come in direct contact with the metal chassis during testing. Use an AC outlet for power whose integrity has been checked with the outlet tester previously mentioned. 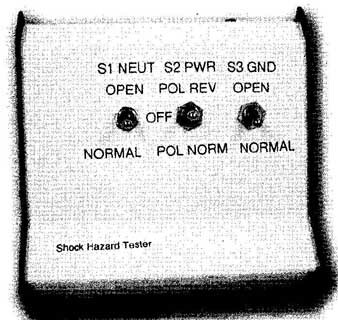 Preset the shock hazard tester switches to their normal (down) positions: S1 NORMAL (neutral closed), S2 POLARITY NORMAL S3 NORMAL (ground closed). Connect an AC voltmeter to J1 and J2. Connect a wire (stranded AWG-14) from J3 to the chassis of the UUT. It must con tact bare metal Good locations are chassis screws or the turntable ground connection on a preamp. Next, plug the UUT into the shock hazard tester outlet with its power switch ON. Plug the tester into the pre tested AC outlet. The leakage current should be zero, because any leakage current at this point will be flowing through the UUT ground. 1. Hold S3 in the momentary GROUND OPEN position. If there is any leak age current, it will be displayed on the voltmeter as mA (1V across 1k resistor R1 will equal 1mA). This leak age should not exceed 0.5mA (equivalent to 0.5V AC on the meter) for a two-wire power cord or 0.25mA for a 3-wire power cord. 2. Release ground switch S3, and place S1 neutral switch in the OPEN position. Momentarily open S3 ground switch to repeat the above leakage measurement. The leakage limit is again 0.5mA or 0.25mA. 3. Release ground switch S3 and, with S1 still in the OPEN position, place S2 polarity switch in the POLARITY REVERSE position. Momentarily open S3 ground switch and repeat the leakage measurement. The leak age limit is again 0.5mA or 0.25mA. 4. Release ground switch S3 and place S1 in the NORMAL position. Leave S2 polarity switch in the POLARITY REVERSE position. Momentarily open S3 ground switch and repeat the leakage measurement. The leak age limit is again 0.5mA or 0.25mA. 5. Restore all switches to their normal positions and unplug the tester from the AC line. Unplug the UUT and turn its power switch off. Remove the chassis connection at J3. If you find any excessive leakage, you should make an internal inspection of the UUT and determine where the insulation breakdown has occurred, and make repairs. After repair, repeat the leakage current testing, and don’t put the unit in service until it has passed all the leakage tests.